Sarah Watts is an award winning British bass clarinettist who has gained an international reputation for her work . Her performances on both clarinet and bass clarinet as a soloist and chamber musician have led to numerous CD releases and invitations to perform all over the world. 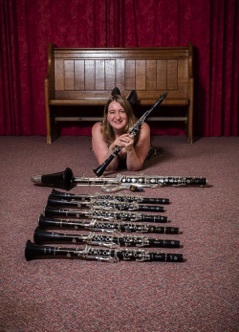 Sarah is passionate about teaching and in addition to being the visiting teacher of solo bass clarinet at the Royal Northern College of Music, she hosts and tutors several courses for adult amateur musicians in the UK and France. A keen researcher, Sarah is an expert in multiphonics for the bass clarinet and has published a leading resource on this subject. Sarah is a Selmer Artist, a Vandoren UK Artist and Silverstein pro artist. Sarah Watts and Elizabeth Kelly gratefully acknowledge support from PRS for Music Foundation. 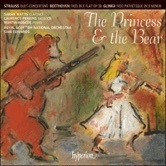 'The Princess and The Bear' is now released on the Hyperion Label via CD and itunes. Sarah makes an appearance on clarinet performing Strauss Duet-Concertino and trios for clarinet, bassoon and piano with Laurence Perkins, Martin Roscoe and the Royal Scottish National Orchestra conduced by Sian Edwards. "Watts does ravishing things (In the Strauss) with the great clarinet melody with which the work opens ..."
"The Duet-Concertino…is beautifully performed here"
"A beauty and the beast tale in which a princess, represented by Sarah Watts’ beautifully lyrical clarinet, dances with a bear..."
To celebrate ten years of Raasay Music Courses, Sarah will premiere 'Ten Wee Drams' in Raasay Distillery in April 2019. These new works funded by Creative Scotland, RVW Trust and CASSGB will be composed by Scottish-based composers and each take inspiration from the heritage, culture and landscape of the Isle of Raasay. The composers are Alasdair Nicolson, Piers Hellawell, William Sweeney , Jane Stanley, Stuart MacRae, Iain Matheson, Pete Stollery, Oliver Searle and Sarah Watts. The tenth composer will be a Scottish or Scottish-based student.